What better way to round off the summer than with a visit to the Perth Home Show?! Evoke Living Homes had the pleasure of hosting a stand at this year's show at Perth Convention and Exhibition Centre from the 29th-31st March. Finding that increasing numbers of people were interested to hear about steel frame technology, Shayne (Account Manager, Evoke Living Homes) and James (Draftsman, Evoke Living Homes ) were in their element! Discussions around the benefits of steel framing and of course, secrets of the unique Evoke Living Homes process that lets us deliver projects in as little as 15 weeks provided grounds for plenty of interesting and enjoyable conversations. As well as delighting in conversation with ambitious new home builders, we also had the chance to soak up the latest the industry has to offer and, to celebrate the event with a prize for one of our lucky visitors. Congratulations goes out to Bas Alnassar, winner of a luxury stay at Crown Towers, Perth! Now, it’s time to see how we can help you put all the inspiration gained into your new build! After all, at Evoke Living Homes, we’re as passionate as you are when it comes to your dream home. If you’re looking for advice and support for crafting your new build, our team would love to assist. It’s the 30 years of experience, building for WA residents that has equipped Evoke Living Homes with the unique ability to complete your new build in as little as 15 weeks. If a unique, fully-customisable home without the extended timeline is what you are after, Evoke are your go-to specialist. All our steel-framed modular and site build designs and are fully customisable, giving you just the right amount of control to ensure your build comes to life exactly as you've imagined it - or maybe even better! If you didn’t take home our Home Show prize, don't worry! 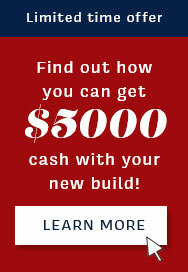 You can still collect $5000 cash when you build with Evoke Living Homes! Our Cash-Back Offer is valid for a limited time only. To find out more, just click the image above or give us a call on 1300 138 653.